There are just some people you are always inspired by. And Sukey of Dress for the Wedding is one of them! Thanks to Twitter, I found her gem of a website in early 2013, and I love seeing how she creates her impeccable collages either around color, theme, or season. So needless to say, I was giddy and honored when she said she'd love to do a very special Hampton Roads-inspired bridal fashion collage just for Tidewater and Tulle! I'll let Sukey take it from here (though I'm completely humbled by her words and friendship)! I have admired Chelsea's contributions to the wedding world as a wedding photographer extraordinaire, boudoir portraitist, and styled shoot maestro, so I was thrilled to learn that Chelsea would be starting her own regional wedding blog. I can think of no other person with more enthusiasm for the perfect detail as well as a complete passion for the area where she lives. 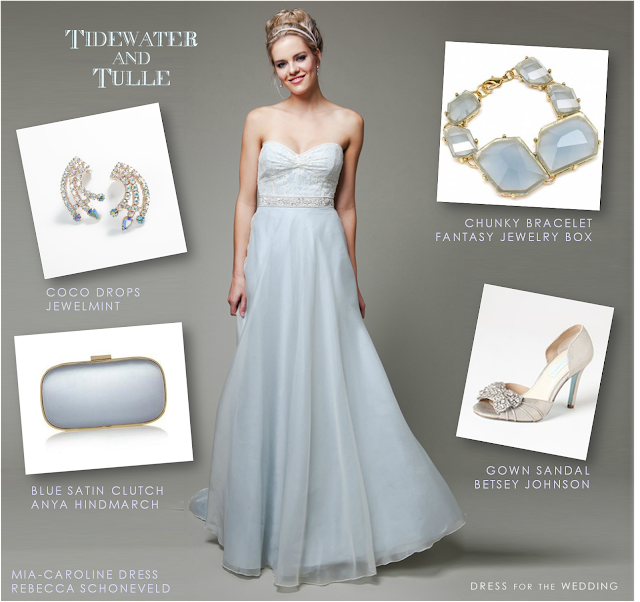 Since I share her adoration of both weddings and the coast, I was honored when she asked me to create one of my blog's signature styled looks to commemorate the launch of Tidewater and Tulle! The combination of soft pale blue with a swath of traditional Williamsburg blue has already become synonymous with the Tidewater and Tulle blog and brand for me, so it seemed only fitting that I find the perfect blue wedding dress to represent a quintessential Tidewater and Tulle bride. Since the Tidewater area is right at the mouth of the Chesapeake where the bay runs into the Atlantic, and is steeped in Colonial history, I wanted to subtly bring the unique themes of that region, while still making this a traditional and wearable modern bridal style. The earrings are meant to represent a ornate abstraction of a wave or tidal bore, and the bracelet reminds me of sea glass with a modern take. The pale blue satin clutch, the lace details of the dress bodice, and the silver sandals are more classic references with a hint of Colonial finery. Tidewater and Tulle's bridesmaid is quite literally draped in tulle, in that lovely Williamsburg blue. I took a more direct approach for this styled look with obvious coastal style references: glamorous shell earrings, starfish necklace and a preppy little shell clutch. This bridesmaid will be just as suited to walking down a sandy aisle at a beachside wedding, as she would as an attendant in a little Colonial garden wedding in town. Whether your heart is by the sea or tied to the Colonial traditions (or a mix of both! ), I hope these style ideas have given you some ideas for your own Hampton Roads area wedding. Congratulations to Chelsea and the Tidewater and Tulle team on your launch! Beyond her website, you can also be inspired by more of Sukey's wedding fashion masterpieces on Facebook and Google+ and you can see what gets her inspired on Pinterest and Twitter.